Next week family firms across the region are being asked to join the campaign to celebrate all that is great about the family business sector by supporting Yorkshire Family Business Day on February 11 2019. Family businesses the length and breadth of the county can get involved by sharing their pride and demonstrating their family ownership via a social media campaign using the hashtag #YorksFamilyBizDay2019 and posting banners/pictures on social media stating their pride in being one of the family firms in Yorkshire today. Paul Andrews, founder of Family Business United, who launched the campaign to give family firms the support and recognition they deserve, said: “There are over five million family firms across the UK and not only do they employ significant numbers of people, generate significant tax revenues and support local communities, they are the backbone of the UK economy, making a massive contribution to the Yorkshire economy too. Yorkshire is blessed with such a diverse family business sector ranging from some of the largest employers in the region such as well known brands Bettys, William Jackson, Shepherd Group, Arco and Harrison Spinks to smaller organisations such as Keelham Farm, Slingsby Gin and Lottie Shaws – all of which all play their part in putting Yorkshire on the map. 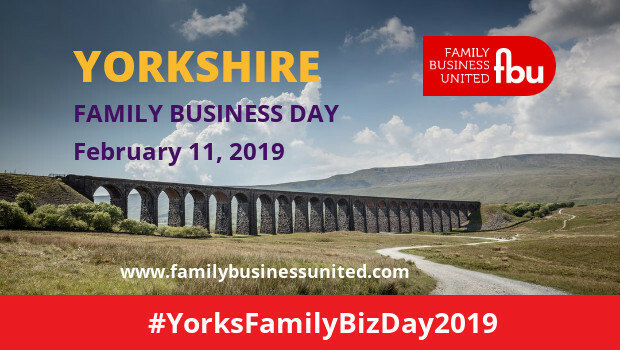 Paul Andrews added: “We have created a day for all Yorkshire family firms to be proud of and by providing them with the resources needed to get involved are looking forward to a day of celebration that will undoubtedly put family firms on the map. On May 9, the National Family Business Show comes to York Racecourse with a day of insights, leading speakers sharing their personal journeys and challenges they faced along the way, together with networking. Exhibitors include Shepherd Building Group, Hawkshead Relish, Hepworth Motor Group, PwC, Arighi Bianchi, Garth West and Potter Space. This free event will be opened by Julian Sturdy MP and representative of York Outer. As someone who has lived and worked in the local area all his life Julian believes that local communities should be at the heart of society and is passionate about keeping them there.